PESHAWAR, Pakistan , Aug 26 2014 (IPS) - Between government efforts to wipe out insurgents from Pakistan’s northern, mountainous regions, and the Taliban’s own campaign to exercise power over the Federally Administered Tribal Areas (FATA), the real victims of this conflict are often invisible. Walking among the rubble of their old homes, or sitting outside makeshift shelters in refugee camps, thousands of children here are growing up without an education, as schools are either bombed by militants or turned into temporary housing for the displaced. Schools have been under attack since 2001, when members of the Taliban fleeing the U.S. invasion of Afghanistan took refuge across the border in neighbouring Pakistan and began to impose their own law over the residents of these northern regions, including issuing a ban on secular schooling on the grounds that it was “un-Islamic”. To make matters worse, a military offensive against the Taliban launched on Jun. 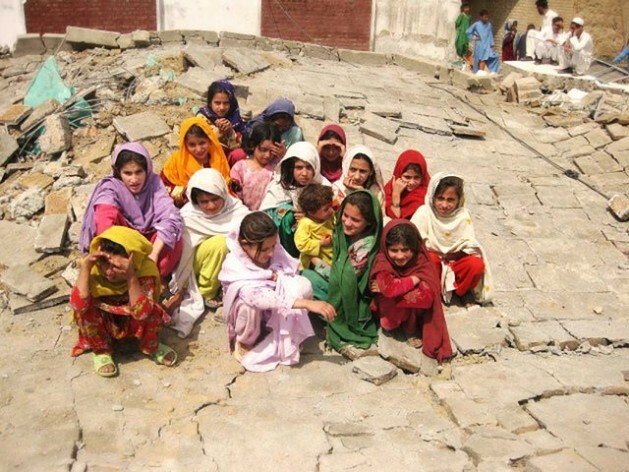 18 has forced close to a million civilians to flee their homes in North Waziristan Agency, one of seven districts that comprise FATA, thus disrupting the schooling of thousands of students. Officials here say the situation is very grave, and must be urgently addressed by the proper authorities. Over the last decade, the Taliban have damaged some 750 schools in FATA, 422 of them dedicated exclusively to girls, depriving about 50 percent of children in the region of an education, says Ishtiaqullah Khan, deputy director of the FATA directorate for education. “We will rebuild them once the military action is complete and the Taliban are defeated,” the official tells IPS, though when this will happen remains an unanswered question. Even prior to the latest wave of displacement, FATA recorded one of the lowest primary school enrolment rates in the country, with just 33 percent of school-aged children in classrooms. Girls on the whole fared worse than their male counterparts, with a female enrollment rate of just 25 percent, compared to 42 percent for boys. The period 2007-2013 saw a wave of dropouts, touching 73 percent in 2013, as the Taliban stepped up its activities in the region and families fled in terror to safer areas. All told, some 518,000 primary school students have sat idle over the last decade, Khan said, citing government records. In the Bannu district of the neighbouring Khyber Pakhtunkhwa (KP) province, where most of the displaced from North Waziristan have taken refuge in sprawling IDP camps, the situation is no better. While the local government struggles to provide basics like food, medicine and shelter, education has fallen on the backburner, and scores of children are losing hope of ever going back to school. Ahmed Ali, a 49-year-old IDP, had hoped that his daughters, aged five, six and seven years, would be enrolled in temporary schools in the camp in Bannu, but was shattered when he discovered that this was not to be. “I have no way of ensuring their education,” he lamented to IPS. A rapid assessment report by the United Nations says that 98.7 percent of displaced girls and 97.9 percent of the boys are not receiving any kind of education in the camps. This is not only exacerbating the woes of the refugees – who are also suffering from a lack of food, dehydration in 42-degree-Celsius heat, diseases caused by inadequate sanitation, and trauma – but it also threatens to upset the school system for locals in the Bannu district, officials say. An existing primary school enrollment rate of just 37 percent (31 percent for girls and 43 percent for boys) is likely to worsen, since 80 percent of some 520,000 IDPs are occupying school buildings. Though schools are currently closed for the summer holiday, the new term is set to begin on Sep. 1. But 45-year-old Hamidullah Wazir, a father of three whose entire family is being housed in a classroom, says few displaced are ready to vacate the premises because they have “no alternatives”. He recognises that their refusal to leave could adversely affect education for local boys and girls in Bannu, but “until the government provides us proper shelter, we cannot move out of here,” he tells IPS. Statistics from the department of education indicate there are 1,430 schools in Bannu, of which 48 percent are girls’ schools and 1,159 are primary schools. Over 80 percent of these institutions are currently occupied by displaced people, of which some 22,178 (43 percent of occupants) are children. In addition to the IDPs who have flocked here since mid-June, KP is also home to 2.1 million refugees who fled in fear of the Taliban over the last decade. These families, too, have been struggling for years to educate their children. “One whole generation has [missed out] on an education due to the Taliban,” Osama Ghazi, a father of four, tells IPS. A shopkeeper by trade, he says that wealthier families moved to KP years ago in search of better opportunities for their families, but not everyone found them. “We have been asking the government to make arrangements for the education of our children but the request is yet to fell on receptive ears,” Malik Amanullah Khan, a representative of the displaced people, tells IPS. Khyber Pakhtunkhwa Information Minister Mushtaq Ghani says the government is in the process of finding alternatives for displaced children. “We don’t want to see these children without an education. They have suffered a great deal at the hands of the Taliban and cannot afford to remain [out of] school any longer,” he told IPS, adding that the government, in collaboration with U.N. agencies, aims to provide educational facilities in Bannu free of cost. Would it be possible to educate the parents and kids in situ, as much as possible, if they are all there in the school, it might help stave off depression and use up some idle time (the mothers need education but probably have the least idle time) – would need money for supplies etc.